NEW! Our decorative planters shaped like hearts are a sweet addition to any yard or patio area! Make these great-looking planters entirely from low-cost landscape timbers. Just cut, stack and screw them together. Plans include full size patterns and complete instructions for three sizes--24", 30" and 36 wide. 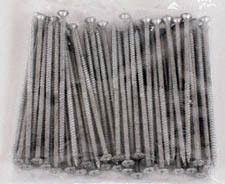 Our 5 inch long Landscape Timber Screws (Item #X105 shown below) are highly recommended for ease of assembly of these planters. Each size requires approximately one box . strip out when using power drills. Zinc plated for outdoor use.